After the age of the Ancient Greeks and the end of the Roman Empire, the science of astronomy went into decline in Western Europe. 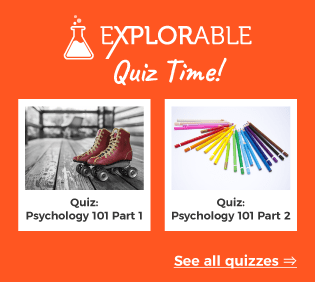 Barbarian incursions and empire building meant that little attention was paid to science and learning, and any such pursuits were limited to monasteries and the homes of nobles. The rise of Islam saw a shift of scientific knowledge from the philosophers of Greece, and the engineers of Rome, to the East. In 762 CE, the Abbasid Caliphate rose to prominence in the growing Islamic Empire and moved from the Arabian Peninsula to Baghdad, perfectly placed to govern such a vast area. Here, they allowed scholars from all over the world to meet and share ideas in the great Houses of Learning. The various trade routes, such as the Silk Road, crossing the region, allowed knowledge from India and China to mix with the wisdom of the Persians, the Greeks, the Egyptians, and the Jews. Great Hindu astronomers, such as Kankah, mingled with Christians, Muslims and Jews. Advances in science, philosophy and culture spread during this time, as the Islamic scholars preserved much knowledge, translating it into Arabic and refining it. 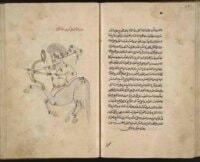 Advances were made in many fields, and the Islamic scholars further refined the scientific method. 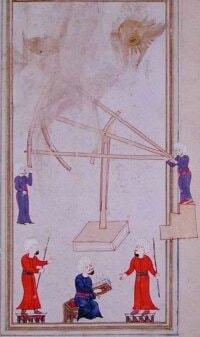 Amongst the advances were the improvements in the field of astronomy, a very important part of life to Arabs. The scholars translated texts from Persia and India into Arabic, along with Ptolemy’s ’Almagest’ and works from Euclid and Archimedes. These works acted as the nucleus around which Islamic astronomy grew and, as with so much of the Islamic knowledge, it passed into Europe and fueled the Renaissance. Living in the deserts of the Arabian Peninsula, the Arabs were already fine astronomers, skilled at using the stars for navigation. Much like the Ancient Greek seafarers, a wrong turn or misdirection meant death, so Arabic nomads and merchants could read the stars like a map. They were in tune with the cycles and phenomena of the universe, helped by the crystal clear skies of their homeland in the Arabian Peninsula. As Islam began to spread, this fueled an interest in astronomy, but one other important factor added to the explosion in the breadth and complexity of research into the heavens; the Qur’an. According to the teachings of Mohammed, Muslims had to pray to Mecca five times every day and, whilst the Arabs knew the direction of Mecca in their own lands, Muslims as far afield as Spain and Persia also had to know the direction of their holy site. They had to know the exact time of day, because praying at the correct time is vitally important to the Muslim religion. As a result, astronomy took on a completely new importance and became one of the most important sciences to Muslims, encouraging the development of sophisticated mathematical and trigonometric techniques. In addition, the Islamic calendar is based upon the lunar cycle, and measuring and predicting the timing and position of the moon throughout the years is crucial to the Islamic world. The Islamic scholars took observation to a new level, breaking away from the ideas of the Greeks, who were mired in the belief that they could theorize and deduce underlying principles. By contrast, the Muslims were great believers in empirical observation and measurement. Islamic astronomy had its roots in making prayer easier, but the astronomers went far beyond that and, in the same way as Newton, we can assume that they wanted to show the perfection of God’s universe. Perhaps the best known of all the Islamic astronomers and mathematicians was Al-Battani (858 - 929 CE), whose findings and books found their way into Europe and would influence Kepler, Galileo, and Tycho. He wrote many books about astronomy and mathematics, with his most famous book, ’KIitabal-Zij’, improving upon the work of Ptolemy’s Almagest. Pointing out some of the errors that the earlier scholar made with mapping planetary motion, he also included a comprehensive star catalog; solar, lunar, and planetary tables; and trigonometric tables and diagrams. Other advances attributed to him were the discovery that the solar apogee is not fixed, but slowly moves; that the ecliptic is inclined; and that precession occurs at a different rate than the Greeks believed. This refutation of Ptolemaic theory became a recurring theme over the centuries of Islamic scholarship, as successive Islamic scholars, whilst believing that Ptolemy and the Greeks were right in their belief that underlying mathematical laws and principles underpinned the universe, pointed out that his application of theory was wrong and that he made many errors. Ibn Al-Haytham noted that Ptolemy’s ideas of planetary motion were wrong and believed that the true principles governing their motion were yet to be discovered. Ultimately, the Islamic scholars instigated a revolt against Ptolemaic and devised new models but, because they did not manage to make the leap to a heliocentric universe, these models were little better than the ones of the Ptolemaic paradigm. Abd-al-Rahman Al Sufi (December 7, 903 - May 25, 986 A.D.) was a Persian astronomer and mathematician who further contributed to the body of work emerging from the Islamic world. His landmark text, ‘The Constellations of the Fixed Stars,’ corrected many mistakes made by Ptolemy, especially in documenting the order of magnitude of stars, and many of the Arabic names that he gave to stars have remained in use. In 964 CE, this astronomer described an object in the sky that he referred to as the Little Cloud, which we now know as the Andromeda galaxy. In the southern Hemisphere, he noted the existence of two further cloud-like objects that he named Al Bakr, the White Ox. These would later be rediscovered by Magellan, in his epic around the world voyage in the 16th Century, and the Magellan Clouds are now known to be companion galaxies of our own Milky Way. 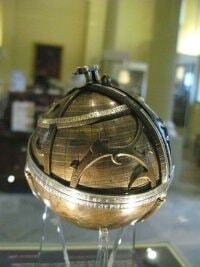 The work of the Muslims extended to inventing and refining sophisticated instruments for measuring celestial bodies, using mathematical precision allied to fine craftsmanship and advanced metallurgical techniques. The astrolabe, used for measuring latitude, was invented by the Greeks, but the Islamic astronomers refined the equipment, improving the accuracy and building beautiful, elegant instruments. Unlike the Greek predecessors, Islamic astrolabes were independent of latitude and incorporated complex gearing mechanisms to track celestial bodies. The scholar Al Biruni (973 - 1048 CE) is credited with inventing the first planisphere, used to track the movements of stars and constellations across the sky over the course of the year, and the device is regarded as one of the first analogue computers. Locating the planets still required the use of detailed astronomical tables and almanacs, but the device allowed Islamic astronomers to make extremely accurate observations of the movements of the planets. Abū Ishāq Ibrāhīm al-Zarqālī (1029 - 1087 CE), known in the West as Arzachel, invented the equitorium, which allowed astronomers to chart the movement of the sun, moon, and planets through the sky, and he devised a lunisolar computer to calculate the time of year and the phases of the moon. Charting time became a dominant theme in the Islamic world, and Al Jazari (1136 - 1206 CE), worthy of mention in the same breath as Archimedes and Heron of Alexandria as a great inventor and engineer, built a mechanical clock that measured time to the hour. Many historians regard this device as the first programmable computer, many years before Babbage, and Taqi Al-Din, in 1559, built a clock that kept time to the second, an immense feat of mathematical and engineering precision. Al-Zarqali improved upon the devices made by the Greeks, and designed huge mural sextants and quadrants that allowed astronomical positions and celestial to be measured in seconds of an arc. The Muslims continued this trend towards larger and more accurate instruments, and Sultan Ulugh Beg of Samarkand, in modern Uzbekistan, built huge instruments that allowed him to measure the sidereal year as 365 days, 5 hours, 49 minutes, and 15 seconds, slightly more accurate than the measurements of Copernicus. He also measured the tilt of the Earth’s axis to be 23.52, a figure that is still used today. One strange anomaly with the Islamic scholars is that they never made the leap of discovering the telescope, despite their knowledge of optometry and the fact that they used observation tubes to scrutinize a section of sky without light interference. The work of Al-Haytham (965 - c1039 CE) included ideas about lenses and parabolic mirrors, but he never made the mental leap into making a telescope. The Europeans ultimately took his work and invented the telescope. Mathematically, the Muslims developed many techniques to measure the cosmos, developing advanced trigonometry, including sines and cosines. It is believed that the Muslims introduced the number zero to Europe through their contact with the Indian astronomers, with whom they shared many ideas during the Zij period (750-19th Century CE). Indian astronomers often gave lectures to the Islamic scholars, and this meeting of cultures allowed Indians to encounter the work of the later Greek philosophers. This particular era saw the Indian astronomers adopt the astrolabe and build great observatories, a period that would only end in the modern age of astronomy at the turn of the 19th century. The observational techniques of the Islamic scholars welded to the mathematical techniques of the Indians resulted in the great Mughal observatories, part of the last flowering of Islamic science. 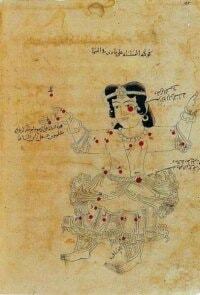 When it comes to astrology, the majority of Islamic scholars, including Ibn Sina (980 - 1037 CE), did not believe in the Hellenistic idea of using the stars and planets for predicting destinies. He used both empiricism and the Qur’an to attack it, in a sign of the first real split between the disciplines, and the development of astronomy as a separate scientific discipline, completely removed from spirituality and mysticism, instead rooted in empiricism and deduction. In line with the Christian thinkers of the first European Renaissance, the Islamic scholars began to seek for non-supernatural explanations for natural phenomena. The idea of separating science and religion was not without some disagreement, and many theologians protested that the findings of the astronomers went against the teachings of their prophet. In a great example of how scholars trained in many disciplines, including theology and philosophy, can create fierce rebuttals, Al Ghazali (1058 - 1111 CE) refuted the skeptics, claiming that those who followed the Qur’an blindly and lived in ignorance, denying proof, were working against Allah. The Islamic scholars, while still incorrect about many things, led to the communication of ideas between Asia and Europe. Their empire encompassed parts of Europe, Egypt, Mesopotamia, Persia, and India, and allowed contact with the Chinese. In that respect, the Islamic Golden Age became a melting pot for these different ideas and, ultimately, provided much of the knowledge that went on to inspire the great astronomers of the Renaissance.